Please join us for a night of community and celebration of life through music! Hosted by Francis Cronin and featuring The Four Postmen, Madus, Christina Blum, Fira Budiman, Ewan Chung, Ale Fips, Chyka Jackson, Devon Michaels, SIRENA, Rena Strober, Benny Wayne Sully, Steph Wilberding & more! 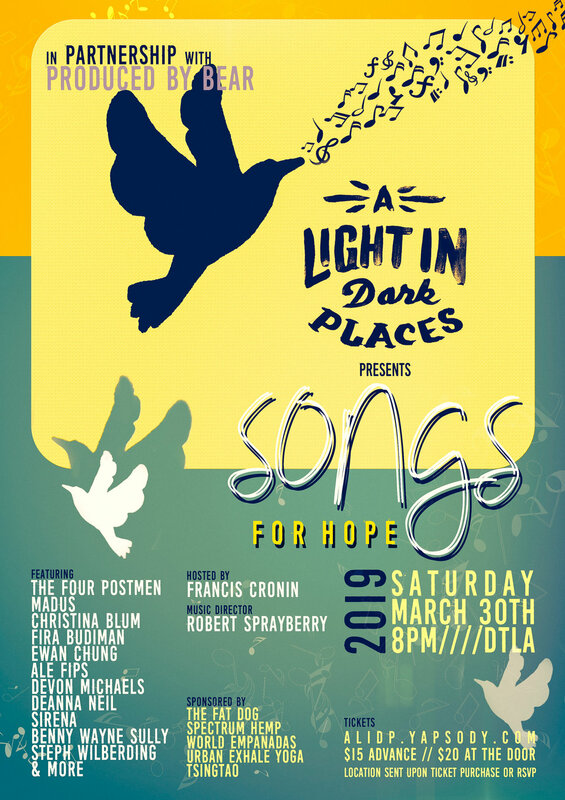 Songs for Hope is A Light in Dark Places' first venture outside of the theater-world and our first partnership with Produced by Bear. As always, our heart is to bring understanding, resources and hope to those who have been affected by suicide through art. Looking forward to sharing this fun, uplifting night with you all! Tickets can be purchased here. Location will be emailed after ticket purchase or RSVP.